WASHINGTON — The United States should consider moving its air base out of Qatar, the Emirati ambassador to the U.S. said Tuesday, encouraging the Trump administration to use its leverage to further pressure Qatar over alleged support for extremism. As the Persian Gulf crisis enters its second week, Ambassador Yousef al-Otaiba of the United Arab Emirates said Qatar's neighbors would "fairly soon" give the U.S. a list of specific actions Qatar must take before punitive steps are lifted. He said the list would likely include Qatari sanctions on bank accounts of individuals that Qatar's neighbors have already sanctioned — and possibly on the banks themselves. "We've gotten fed up. We've had enough," Otaiba said. In their bid to isolate Qatar by cutting off diplomatic ties, the UAE, Saudi Arabia and other Arab countries have been emboldened by President Donald Trump, who has forcefully echoed their accusations that Qatar funds terrorist groups and foments instability in the Mideast. UAE Ambassador Yousef al-Otaiba said both his country and the U.S. had allowed "bad behavior" by Qatar to continue for "a very long time." "If I want to be honest, I think the reason action hasn't been taken against Qatar is because of the air base," Otaiba said, referring to al-Udeid air base, not far from Doha. "The air base is a very nice insurance policy against any additional pressure." Home to some 10,000 U.S. troops, the base has emerged as a flashpoint in the dispute between Qatar and its neighbors, the worst in the Persian Gulf in years. The forward headquarters of the U.S. military's Central Command is a staging point for U.S. air campaigns in Iraq, Afghanistan and Syria. "Maybe someone in Congress should have a hearing and just say, you know, 'Should we consider moving it?'" Otaiba said. "And maybe not moving the entire base. Maybe just distribute to various countries so you don't have all your eggs in one basket." Otaiba told reporters that the UAE hasn't told the U.S. it should consider moving the base, but is "willing to have that conversation." And he suggested American troops could be moved to his country, instead. Pointing to new defense cooperation deal the U.S. and the UAE signed last month, Otaiba said the "infrastructure is in place" to have the conversation if the U.S. wanted to relocate. The U.S. already has some troops in the UAE. The Pentagon has said the new document "provides the U.S. military with the ability to more seamlessly respond to a range of scenarios in and around the UAE, if necessary." Saudi Arabia, the United Arab Emirates, Bahrain and Egypt cut diplomatic ties with Qatar last week, accusing it of backing terrorism and promoting policies that destabilize the region. Qatar denies those allegations. Trump has offered Secretary of State Rex Tillerson to help mediate a resolution, but other countries including Kuwait have also gotten involved. 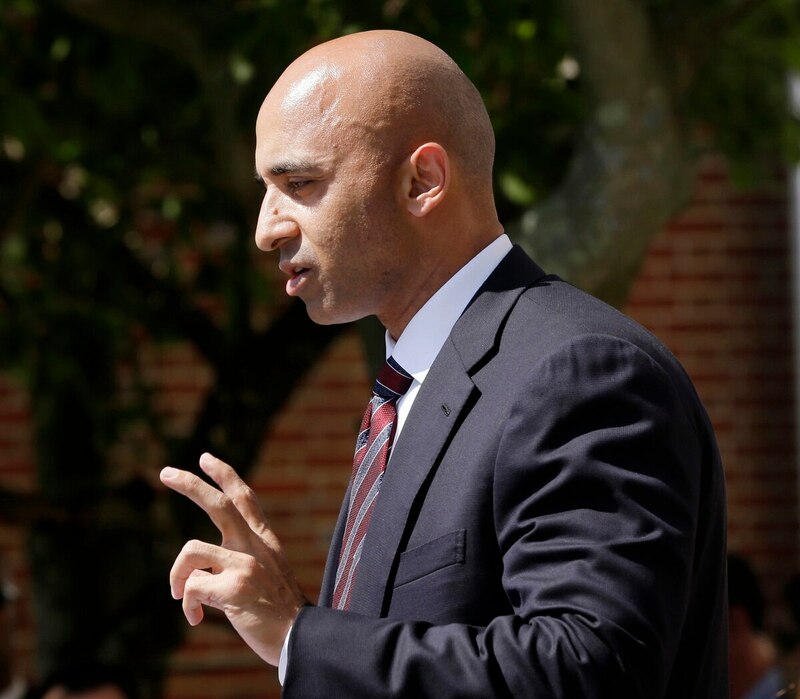 Otaiba said the forthcoming list of demands would center on three complaints about Qatari behavior: support for terrorism, meddling in others' internal affairs, and use of state-backed media to attack neighbors. He said the list would likely include expelling terrorists from Qatar and shutting down or curtailing Qatar-funded media outlets that attack UAE and others. He said al-Jazeera, the Qatari-backed television network that has drawn particular consternation from Qatar's neighbors, would likely be on the list of issues Qatar address would have to address. The Emirati diplomat said his country was hearing only support from the White House on its move against Qatar, despite Tillerson's call for the UAE and the others to ease the steps they took to isolate Qatar. "That's not going to happen," Otaiba said. Still, he said he did not foresee the crisis becoming a military conflict, even if Qatar refused to bow to demands. Even if Qatar does accept the list of demands, Otaiba said they'd have to fulfill specific steps over a period of time to show seriousness before the countries would restore ties to the tiny, gas-rich country. "There will be an escalation of economic pressure" unless Qatar changes course, Otaiba said.